Launching the CSA, getting some media, and admiring the sunsets. Welcome to our first blog post! We'll aim to do these monthly-ish, but it'll probably end up being a bit sporadic and mildly chaotic, in typical Pig and Earth style. We'll use this as a space to share our farm news, stories, and latest images. We'll also share more about how and why we farm, in the hopes of offering more insight and transparency for those interested. We'll try to contribute to the growing conversations about food, farms, animal rights, environmental challenges, climate change, and all the things that connect them. But we'd love to hear from you about what you want us to cover in the blog - do you need more pork recipes? do you want readable rants on the state of global food politics? are you craving more Rosie-the-farm-dog content? Let us know! Our biggest news is that we launched our first trial season using a Community Supported Agriculture model! After years of researching, debating, planning, budgeting, and worrying, it's been so exciting and nerve-wracking to put it out into the world. Luckily, we've been really thrilled and grateful for the response we've received. Already, almost all of our memberships have been snapped up, and we've been receiving heaps of great messages of support and offers to get involved. To add to our excitement, we serendipitously launched our season at the same time as some media outlets became interested in CSAs. Check out our blog entry to watch some of the coverage. CSA is a model where our members buy into a season of our produce - they pay in advance, and each month receive a box of mixed pork cuts. But the most important part of CSA is that it facilitates much closer connections between consumers and farmers. It means that we share in the responsibilities and rewards of farming, and allows our members to really know where their meat comes from. Community Supported Agriculture is important to us as a way of building alternative methods of growing and sharing food in ways that don't harm our planet and people. For us, it means financial stability, longer term planning, and a more ethical and sustainable model of farming. For our members, we hope it means more nutritious food and a stronger connection to where their food comes from. If you want to read more about CSAs, you can check out this great explainer article by the Open Food Network Australia. Little photos and stories of daily life at Pig and Earth. Rosie loves fresh eggs, so when we're collecting them she's usually sneakily watching and hoping that some drop so that she can hoover them up. Unfortunately for Rosie (and the rest of us!) our egg production is dropping right now due to a few factors. We've been losing hens to what we assume is a fox - first we lost 10 in one morning, and since then have been losing 1 or 2 at a time over a few weeks. The remaining hens have gone off laying because they're moulting (shedding feathers), brooding (sitting on eggs), or possibly just don't feel like laying this close to winter (it's not even cold yet!). Here's Andromeda, normally one of our best layers, with the single yellow chick that she decided to hatch. She won't be back on egg production until the little one is a bit more grown up. It's so cute that it's almost worth it. Fingers crossed the chick is a hen! 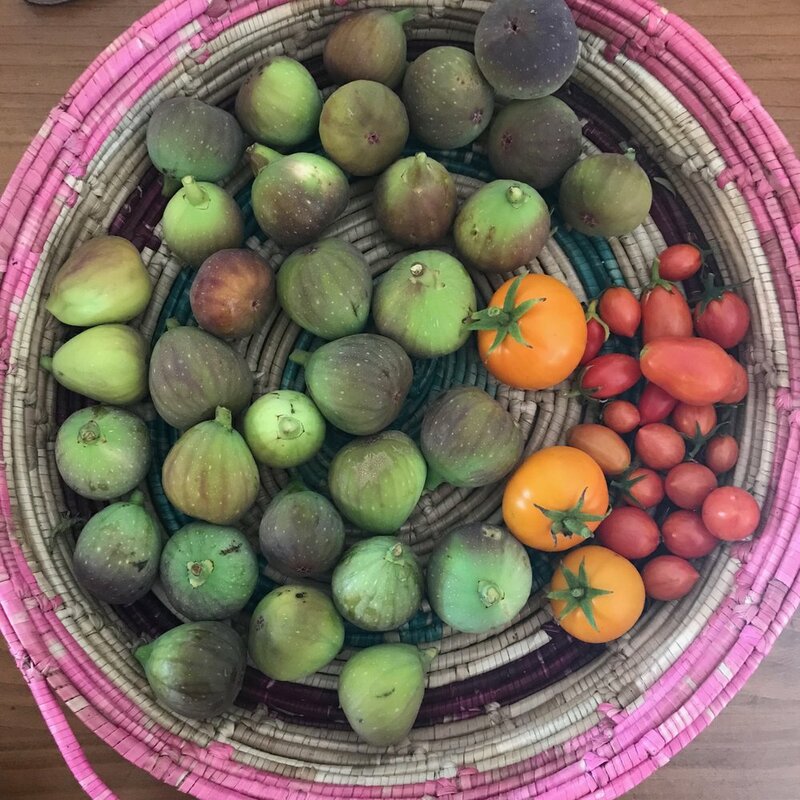 Just as our tomatoes started to slow down, our fig tree pumped out such an abundance that we struggled to keep up. A pretty great problem that we dealt with by snacking on fresh figs everyday for weeks, adding them to cooking, and drying them in batches. It's almost fig overload, but since we probably won't eat figs again until this time next year, there's nothing to do but bask in the figgy moment. Pear, one of our sows, snacking on hawthorn berries. Pear & Parsnip - two of our favourite pigs. We’ve had these sisters since they were small enough to pick up in your arms (seriously! ), they’ve been with us at all of our rented farms, and now they’re our star sows at our home farm. They’re also now probably 250kgs each! Great mothers, docile to work with, and friendly enough to love pats and back scratches. 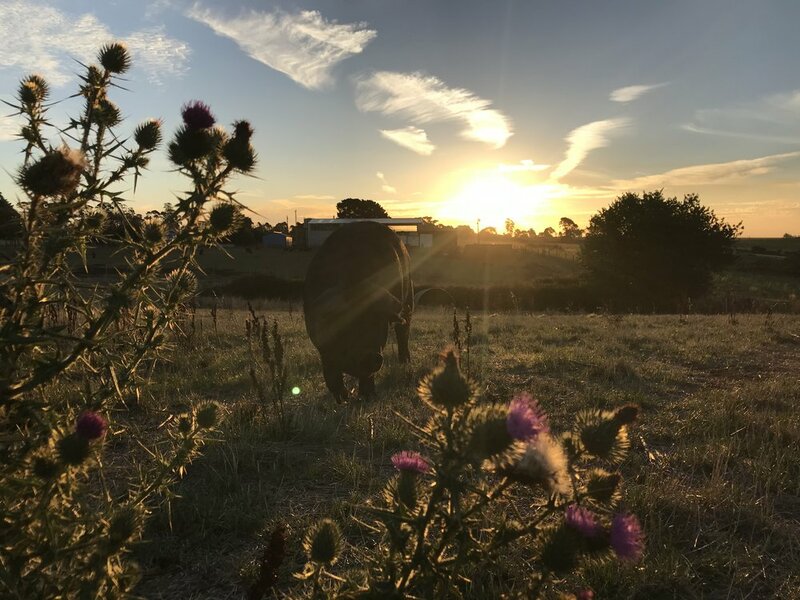 With the arrival of cool Autumn nights, we've noticed that Pear, Parsnip, and Boris (one of our boars), have started taking slow dusk walks around the hill in their paddock. We've been joining them regularly to watch the sunset and enjoy quiet moments. Photos can't quite do it justice, but here's some snaps anyway.